How Close Are We To a Zika Vaccine, Really? Three prevention methods are showing early promise. Could a method of protection against the Zika virus be on its way? According to new reports, things look promising. The Zika virus has been named a public health emergency and is posing a major threat to pregnant women—the virus has been linked to microcephaly, a disorder that causes babies to be born with abnormally small heads and incomplete brain development—but scientists might be on their way to establishing a vaccine. According to a report from the BBC, researchers are testing three distinct ways of designing a vaccination for Zika, and all three show promise. Through testing on rhesus monkeys, scientists have discovered that all three options appear to offer complete protection. 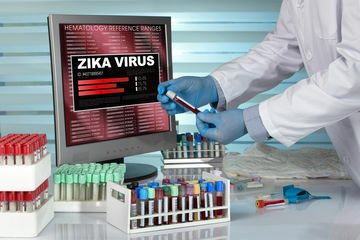 The different approaches include one inactive (and therefore harmless) replica of the virus itself, and two that use parts of Zika's genetic code. But before you get your hopes up, let us offer up a dose of reality: These vaccines are still very much in the early stages of development, meaning it could be years before one or all of them are available for widespread use. The fact that scientists may have pinned down a few effective methods of protection is great, but it's definitely a preliminary step. There's still the matter of making sure the vaccines are safe to use: They'll likely begin early trials as a next step. "All of the vaccines currently under development are many years away from being licensed and available for widespread public use," Edward Wright, PhD, a senior lecturer and virologist at the University of Westminster, said, according to the BBC. Jonathan Ball, a professor of molecular virology at the University of Nottingham, weighed in on how long it will take for the vaccines to be available to the public as well. "We knew that these vaccines worked in mice and now the researchers have shown that they also protect non-human primates from Zika virus infection," he said. "The next step will be to see if these vaccines are safe and the scientists hope to start early trials in humans to address this." In the meantime, the CDC's recommendations remain the same: Women who have traveled to an area where Zika is being locally transmitted (which now includes parts of Miami, Florida), are advised to wait at least eight weeks before trying to conceive. A man who has traveled to one of these areas, though, should wait six months before trying to conceive as the virus can live longer in sperm. All pregnant women should also be assessed of their Zika risk by a doctor.